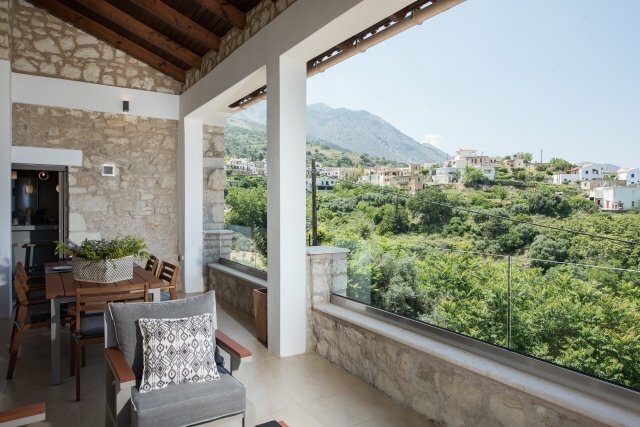 Villa Acrothea is located in the traditional village of Kournas and offers you the tranquility and idyllic surroundings you are longing for on a unforgettable holiday in Crete. 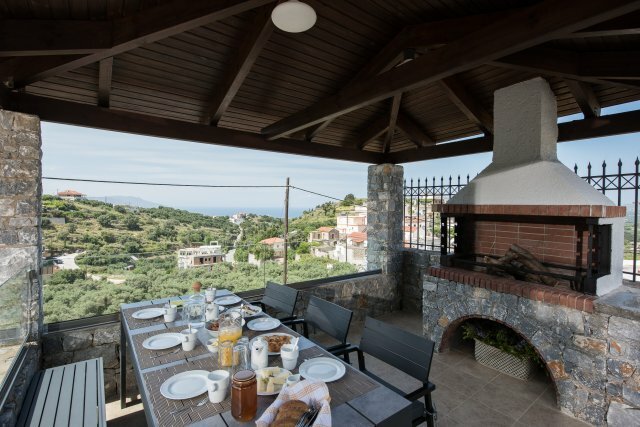 You will enjoy the fabulous seaviews and mountainviews in the privacy that the Villa offers. 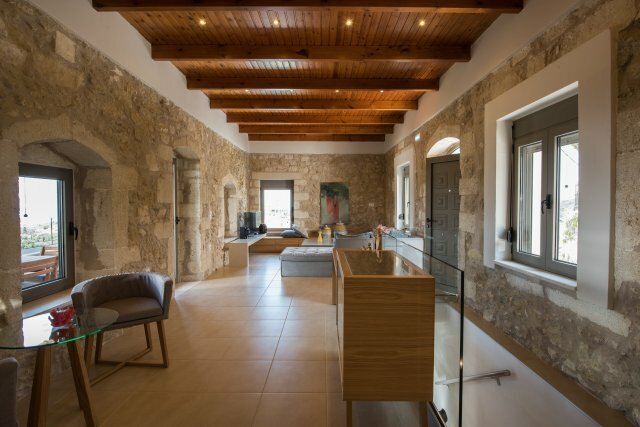 The Villa was fully renovated and newly furnished with high quality materials in 2014, with a pool which is equipped with a jet stream. Your Children will have the time of their lives splashing and playing in the pool whilst you will be able to sunbathe and relax in the lounge area next to them, whilst also keeping an eye on them! The Villa has in total 3 bedrooms and 2 bathrooms, and a seperate guest toilet. One bathroom has a shower whilst the other has a bath-tub and both have WC’s. 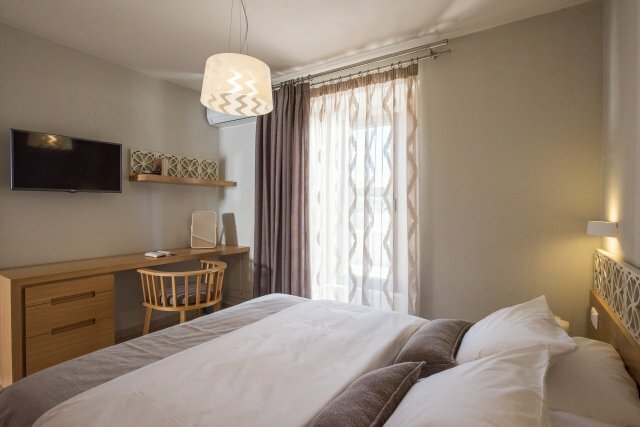 Also included is free WiFi, Satellite TV and air conditioning in each room. 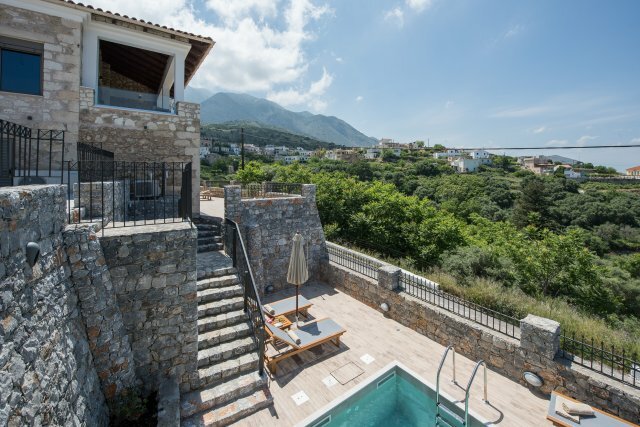 The Villa has underfloor heating and can be rented all year round. 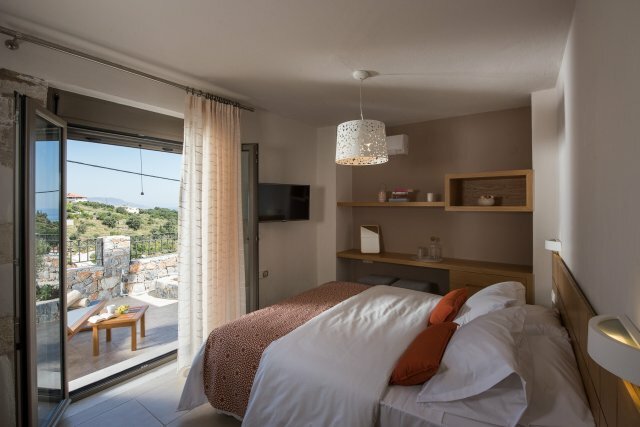 The rooms have balconies or terraces with incredible views of the azure sea and the glorious Cretan mountains. 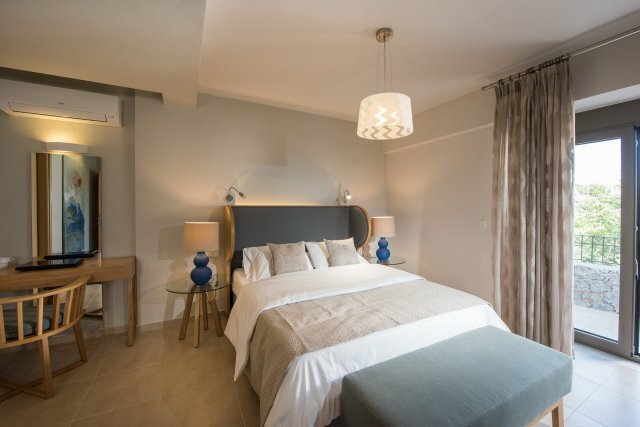 The master bedroom with a double bed, has an ensuite bathroom with bath-tub and also a dressing room with a safe, the other 2 bedrooms have each 2 single beds that can be used also as a double bed. There is also a lounge area with a sleeping couch that can be used for one person, to accommodate in total 7 persons. 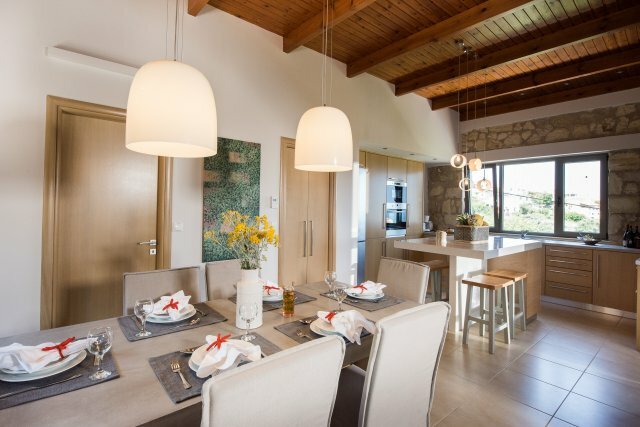 The Living and Dining area is spacious and has a contemporary style with a covered veranda on the northside, with lounge area and dining area, with panoramic views of the idyllic surroundings of the village, the mountains and the sea. The kitchen is modern and fully equipped with dishwasher, ceramic cooktop and oven, microwave, refrigerator with freezer compartments, and all the essential pots, pans, crockery, dishes, cutlery and glassware you will need plus it also has an extractor fan, coffee-maker, electric kettle, toaster, juice squeezer and all you would need to create any culinary experience you desire. 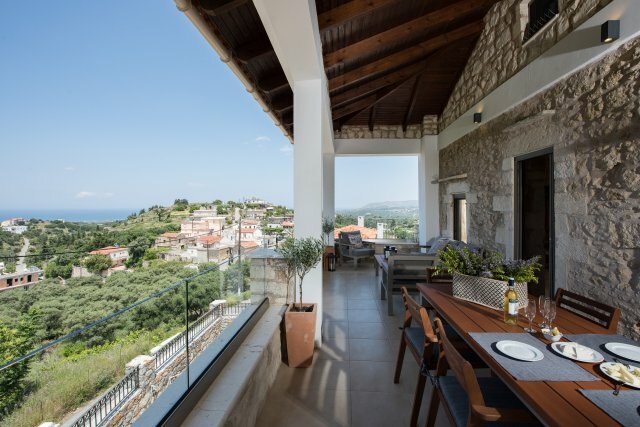 The outside terraces and balconies setup in different levels lead you to the pool area and the bbq area and offer you panoramic views of the surroundings and the sea, where you find the tranquility and privacy with newly created stone walls which surround the property. There is a parking space and a fully automated electric gate, and a camera security system which offers safety and privacy. 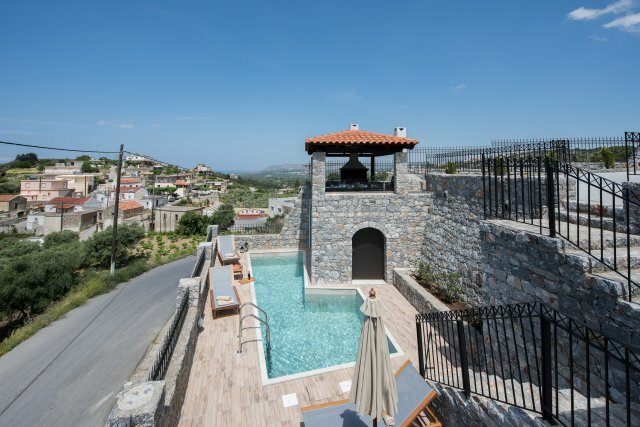 Villa Acrothea is located in the traditional village of Kournas, close to Lake Kournas, Georgioupolis and Kavros. 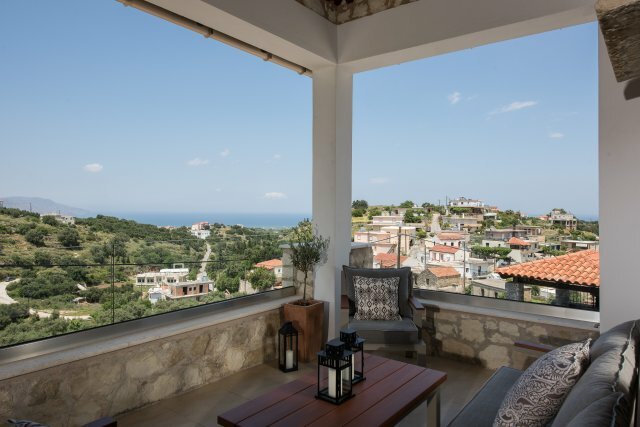 Kavros, the nearest tourist town, is less than 4 km, where you can find shops, cafeterias, bars, tavernas and supermarkets and access to the beach. The 9 km (6 mi) sandy beach is the main attraction of the area, with Kalyvaki beach on the other side of the river of Georgioupolis as well. The small fishing village, Georgioupolis, about 7 km, is very much a tourist town now, with many cafés, tavernas and small hotels and apartment blocks. The town square has been renovated with fountains and is surrounded by outdoor seating used by tourists enjoying their drinks and ice creams. Nearby Lake Kournas, less than 3 km, is also a popular excursion. Crete’s only freshwater lake, has a perimeter of 3,5 km and a diameter of almost one km. You can find taverns and restaurants overlooking the lake and down at the lake there are more. During the tourist season there are paddle boats, canoes and sunbeds for enjoyment. Argyroupoli is a village in the municipality of Lappa, Rethymno, altitude 260m. It was previously known as ancient Lappa. Most of the drinking water in the region comes from here and worth a visit, with small waterfalls, and many taverns. Less than 20 km, about 20 minutes by car is the city of Rethymnon, it is an old Venetian harbour town, with a lot of history, numerous Byzantine churches and monasteries, enchanting Venetian monuments, the most well-preserved Renaissance city in Greece, with endless beaches, caves, gorges and unique flora and fauna. Less than 45 km, about 45 minutes by car is the city of Chania, it constitutes a crossroad of civilizations and continents with a long history, natural beauty, unique architecture and rich tradition. The main characteristic of the city is the Venetian port of the old city with the Egyptian lighthouse that has survived for many centuries and attracts the eye of residents and visitors. 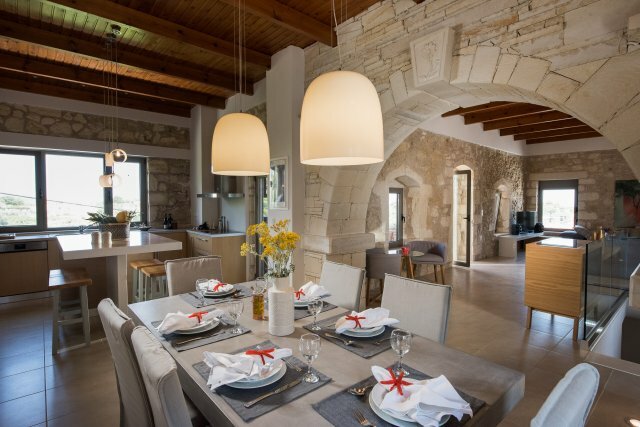 The Villa is fully renovated and finished with high quality materials.